Every year where I grew up, we had November 15 off of school. It wasn’t always that way. Over the years as we grew up, so few kids came to school that day, the district finally caved and it became a recognized day-off, no absences counted. What, you ask, happens on November 15? Opening day of deer season. Boys and men dressed in their favorite flannels and boots and headed out to their deer blinds as if heading off to war. The ladies? They went to Green Bay to go shopping. As a gal in a vegetarian family, let me just say, it wasn’t a big deal around our place other than that it meant my mom would make us wear big, ugly, orange vests. And let me tell you…you don’t want to be tra-la-la-ing in the woods in a brown Carhartt jacket once November 15 hits. There are some trigger-happy hunters out there. Anyhow, back to present day. One of the awesome perks of being a Cooking Light blogger is that they send goodies my way! For instance, this fun cookbook showed up on my doorstep the other day. Author Allison Fishman Task tasted her way through the United States, sampling each area’s regional specialties. In this cookbook, she features these specialties, but in true Cooking Light style cuts fat and calories, offering the health conscious among us an opportunity to expand our palate without expanding our waistline. I was so excited to try a recipe to see if her reduced calorie and fat recipes tasted as good as they looked. In honor of my November memories as an orange-vest-clad little yooper girl, I jumped at the Red Flannel Hash. As many of you know, I also have a certain sweetie who’s wardrobe consists of about 30 flannel shirts in a rainbow of colors. How many more reasons do I need to make this Saturday into a Plaid-urday? Ha…I crack myself up sometimes. I’m crazy about squash in the fall so I adapted this recipe slightly to incorporate my seasonal favorite. I also added a few roasted tomatoes I had on hand. This recipe was a great make-ahead recipe for me. On Friday night I roasted the beets, potatoes, and butternut squash. On Saturday morning, this recipe came together quickly with a little pan frying of the vegetables and preparing the eggs (in the recipe she poached the eggs in custard cups–I chose to fry them). Lastly, I omitted the corned beef to stay true to my cooking style. The result? 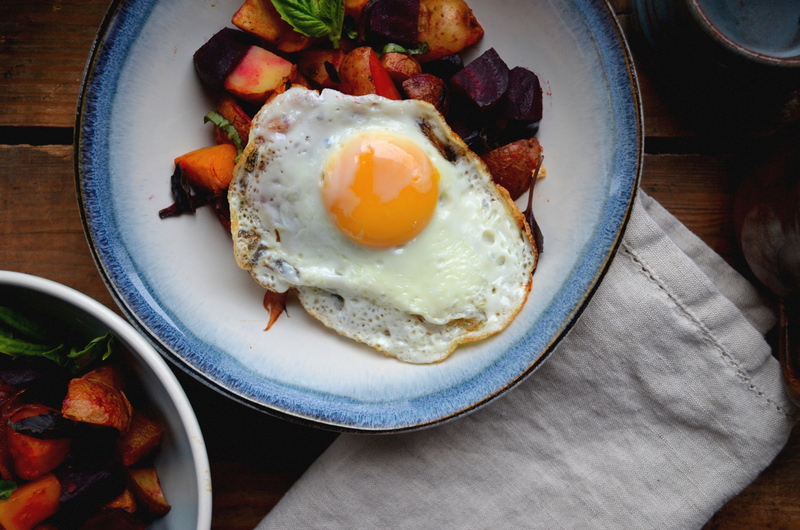 A warming and colorful breakfast with some of my favorite foods. And all at 243 delicious little calories. And now………THE GIVEAWAY! I want all of you to travel the states in your own kitchen with a copy of this cookbook. 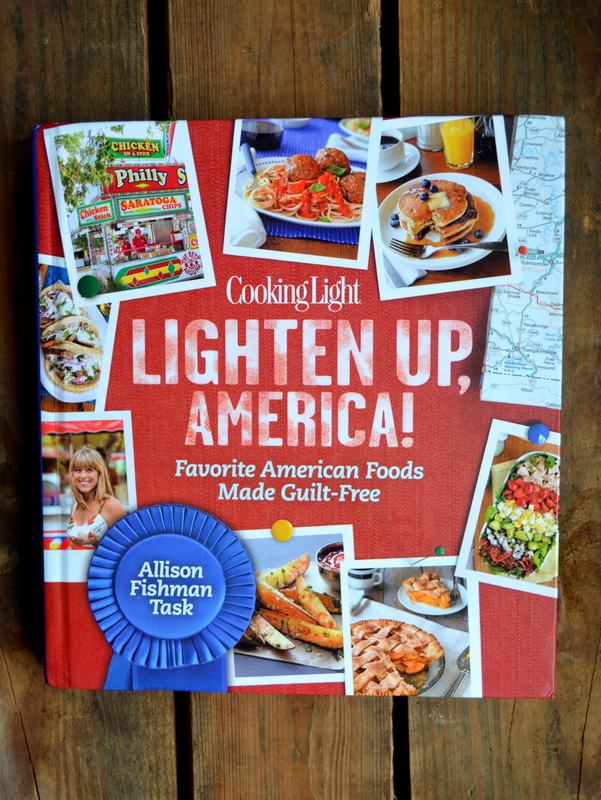 And because of that…I’m giving away a second copy of Lighten Up America! to one of you lucky readers. I’m hosting this giveaway on my Dinner With Aura Facebook page. To enter to win, you will need to “Like” my Facebook page and leave a comment that says you are entering to win Lighten Up America! One entry per person per day, please. I will announce the winner on November 30. Cut butternut squash in half lengthwise and scoop out seeds. Place cut side up on a baking sheet and sprinkle with salt. Bake for 45 minutes to an hour until tender and remove from oven. Let cool. Cut into 1/2 cubes. You will have some squash left over–keep and use for other recipes. 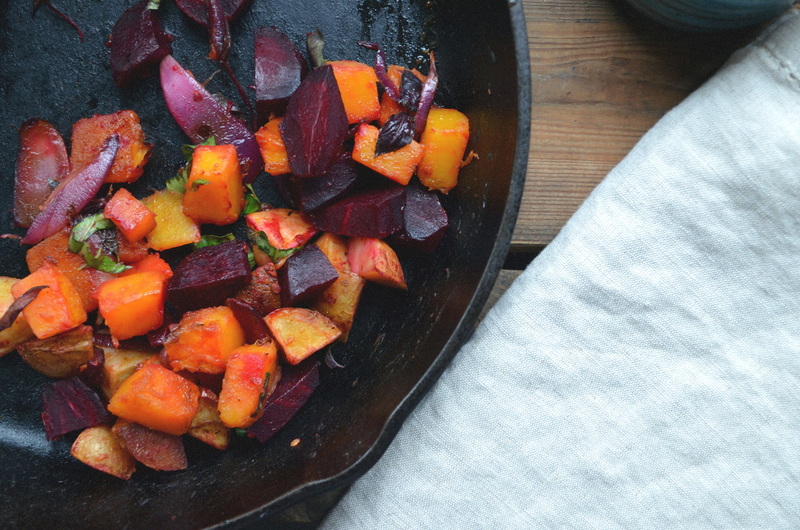 Place potatoes and beets in a metal baking pan lined with foil. Bake at 400° for 1 hour or until tender. Remove from oven, and cool 30 minutes. Peel potatoes and beets, and cut into 1/2 inch cubes. Heat a large skillet over medium-high heat. Add oil to pan; swirl to coat. Add red onion; sauté 3 minutes or until tender. Stir in ketchup, Worcestershire, salt, pepper, squash, potatoes, and beets. Heat up a skillet for the eggs and spray with cooking spray or drizzle a little oil in the pan. Crack eggs into pan and cook to your liking. Divide hash evenly among 4 plates. Carefully loosen eggs from pan and place 1 egg over hash on each plate. Sprinkle basil and black pepper evenly over each serving. Serve immediately. 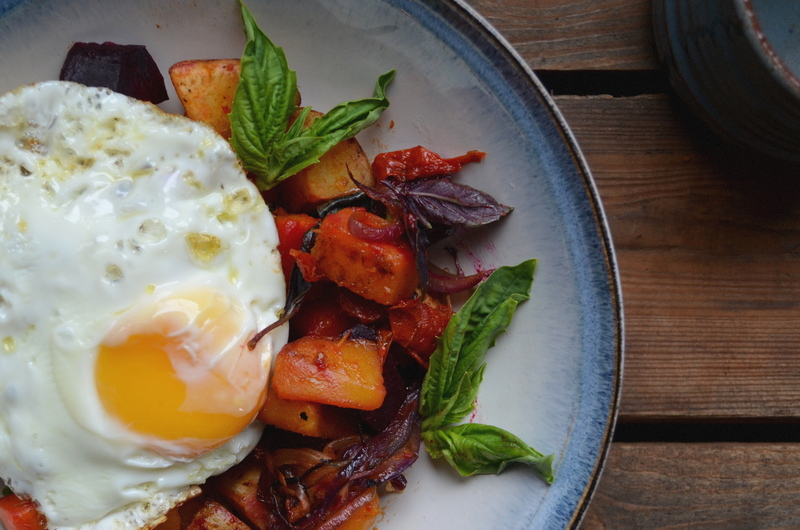 Serves 4 (serving size: 1 cup hash, 1 egg, and 1 tablespoon basil). 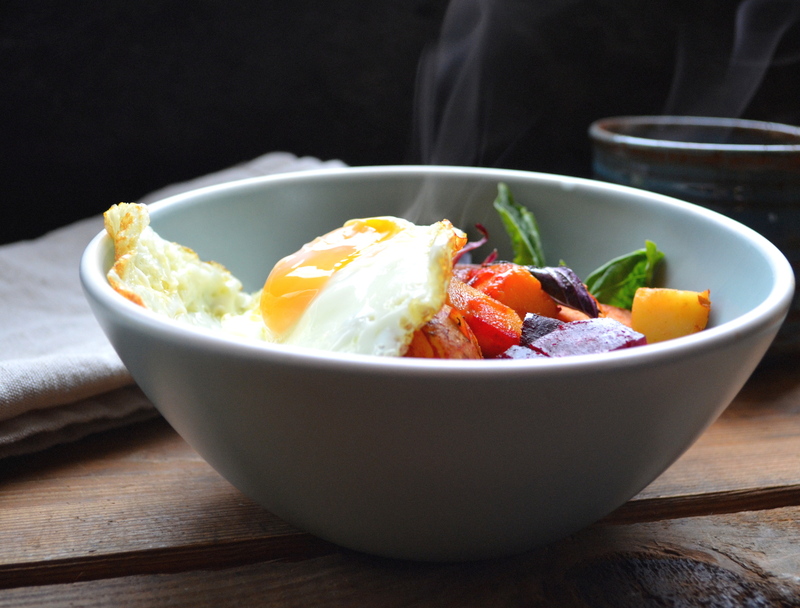 NOTE: Roast vegetables ahead if you want to save time in the morning and make this a quick breakfast! The hash looks amazing! I always love your spin on recipes. This will make a great breakfast for dinner! Forgive me, but I had no idea that deer had thumbs! This looks delicious. Great photographs. Thanks for the recipe. Thanks for the reminder! We had a busy weekend. Just did the drawing and Elise Hollister is the winner. 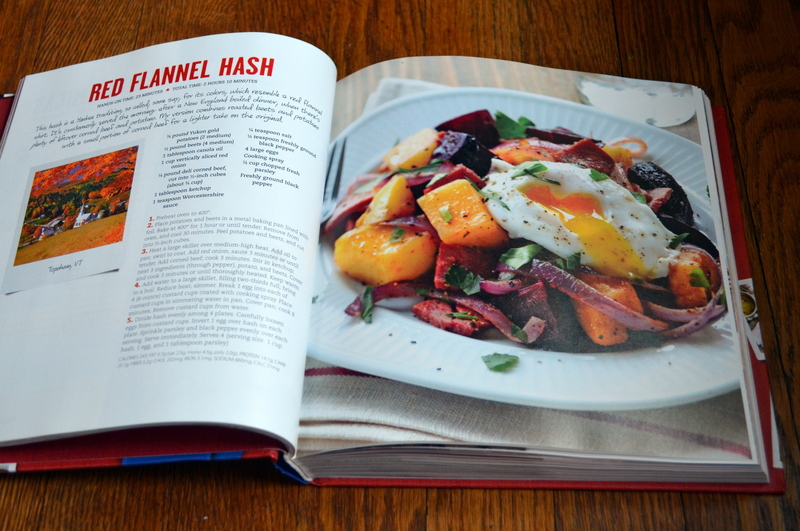 I’ll have another giveaway coming up soon for a photography book from the editor of Cooking Light Magazine. Stay tuned and thanks for entering to win this cookbook!